May 17, 2016 Researchers at UC Berkeley discover a target that drives cancer metabolism in triple-negative breast cancer. “We were looking for targets that drive cancer metabolism in triple-negative breast cancer, and we found one that was very specific to this type of cancer,” said Daniel K. Nomura, an associate professor of chemistry and of nutritional sciences and toxicology at UC Berkeley and senior author for the study, which is published online ahead of print in Cell Chemical Biology. 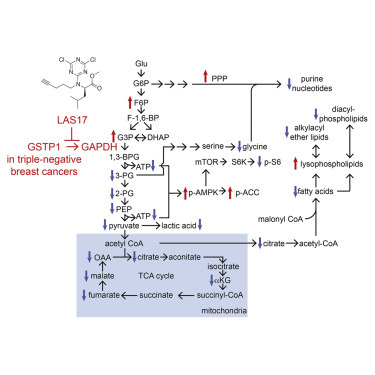 Breast cancers possess fundamentally altered metabolism that fuels their pathogenicity. While many metabolic drivers of breast cancers have been identified, the metabolic pathways that mediate breast cancer malignancy and poor prognosis are less well understood. Here, we used a reactivity-based chemoproteomic platform to profile metabolic enzymes that are enriched in breast cancer cell types linked to poor prognosis, including triple-negative breast cancer (TNBC) cells and breast cancer cells that have undergone an epithelial-mesenchymal transition-like state of heightened malignancy. We identified glutathione S-transferase Pi 1 (GSTP1) as a novel TNBC target that controls cancer pathogenicity by regulating glycolytic and lipid metabolism, energetics, and oncogenic signaling pathways through a protein interaction that activates glyceraldehyde-3-phosphate dehydrogenase activity. We show that genetic or pharmacological inactivation of GSTP1 impairs cell survival and tumorigenesis in TNBC cells. We put forth GSTP1 inhibitors as a novel therapeutic strategy for combatting TNBCs through impairing key cancer metabolism and signaling pathways.